Japan has rainy season which i in June. Hiroshima finally got into rainy season this week.. I wish the weather will not bpther people who is traveling in Japan. Have you tried Japanese style curry? Somehow I am into Curry these-day. 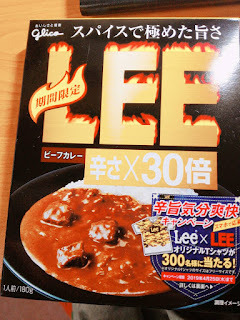 Not only normal curry but HOT curry! I would say quite hot. You do not have to go to restaurant, You can get "
Pre-packaged curry" everywhere in Japan. Such as supermarket and convenience store. There are usually "Mild,Medium spicy, and Spicy". But look what I found !!! "Ｘ30" mean is 30 times more spicier than "Spicy"!! And it was really spicy!! Like a burning!!! But it is also tasty so if you have any opportunity please give it a try! It will be one of your great experience in Japan, and you will enjoy it! !